Welcome to another year of Badwater 135. I hope the temperatures hover above 130F during the day and 120+ at night (my conditions in 1977). You guys have had it too soft (cool) over the past few years. It’s been hotter in Lone Pine than in Death Valley. But, I do wish all of you good health and a successful completion of this year’s ‘BW-135’ 2009. In less than 24 hours you will ascend the balance between: mind, body, spirit AND the unknown. To each participant, I ask of you ………. for YOURSELVES: acknowledge, appreciate and respect these powerful God-given individual strengths. Use them effectively, placing one foot in front of another as you follow the “long, white line”. Never take these wonderful assets for granted”‘They” are gifts and will be the “pillars” of your life as an Ultra Athlete and beyond. Very few athletes have the ongoing insight to recognize the marvels of their personal achievements. Abilities, too often, are taken for granted. Not ‘bragging-rights,” nor egos. Unfortunately, it wasn’t until AFTER my neck injury that I became aware of my “loss,” so I use my own experience to stress this issue. It seems only like yesterday, but 30+ years ago I was invincible, not the best, but still invincible. 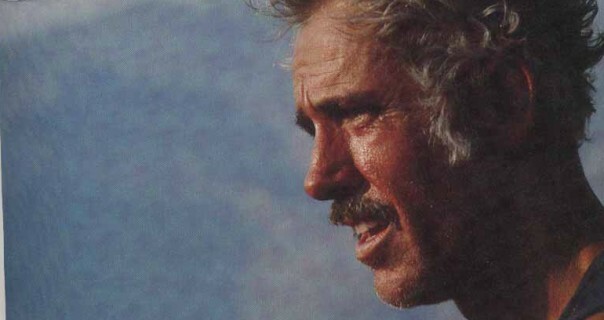 In a matter of seconds, in a surfing accident, my life changed, not for the worse, but it did change … forever. I had severed half of my spinal cord. But, my determination has increased tremendously, helping individuals recognize the value and beauty of your God-given mind and body. I wonder how many of you can do the following? Standing on one foot, change your socks/shoes or put on a pair of slacks? How about scratching your ear with your little finger? Have you ever had the fear that you won’t be able to get off the toilet seat? How about falling down, you’re not hurt, BUT unable to get up? Have you ever given thought to the beauty of just being able to stand? These are simple basics of motor-skills that few of us acknowledge. Now, we discuses the super-human achievements just as a matter of course. I mention these personal vignettes because they are the source of my strength. This is not a woeful tale of Al Arnold, the “old man of bygone years,” but a determined Ultra Athlete who continues to express little tolerance for wimps! I remind all of you: before you quit, think about the time, the money and the “media-BS” just to get to the Badwater starting line. And, what about all that awaits your return after finishing the race? My feeling is: YOU START, YOU FINISH!!!!! Nothing else! Hello everyone. I would like to remind, ALL OF YOU, why you are “in-the-running.” As individuals it is imperative that you Finish What You Start! Being a member of the Application Review Committee, I have evaluated hundreds of BW applications and have never seen any Badwater Ultramarathon where ALL of the participants finished the event. To enter this event I expect that all of you are capable of a respectful elapsed time of 60 hours or less. But, when you fail to finish …….. this IS NOT acceptable!! In ’02 (when I was at the race in person) I was shocked to see all of the “In need of medical treatment or sleep” at Stovepipe Wells What was that all about? It’s only @40 miles. That’s not even a third of the way. This Ultra event invites only the toughest because that ‘Long White Line’ is supposed to be a realistic challenge for the hardy. If you feel that you’re not up-to-the-task …….. do yourself a favor: STAY AWAY from the starting line. Remember ‘Forest Gump’: “Stupid is as stupid does”. IF you manage your crew and yourself, you will finish this race. With a few exceptions, this Ultra is not about your finishing time BUT, it is about your being able to finish. Either you have “heart” or you don’t! Statistics will predict the recording of “DNF’s”. Collectively, EVERYONE should start putting pressure on this concept. I guarantee that ANYONE that is recorded as a DNF (unless you get run-over by a ‘blue lizard’), will be be very unhappy with my ranking of a ZERO on a future application. That could receive my recommendation of ‘one year’s probation’. That, my friends, is “tough love”! If you’re tough, then PROVE IT! Not to me but to yourself. So, IF you all pull-together then BW 135 will have demonstrated that, not just a few, but the entire field is a great success. Who, after all those hours and miles of training, wants to return home with a DNF!? How can I be so adamant, you might say, when I DNF’d in ’74 and ’75? My crew member almost died of intense heat in ’74. He wasn’t even past Furnace Creek. In ’75 I had just passed Towne’s Pass …. in 10 hours. That was it: too heavy, too fast & “Stupid is as stupid does”. No one here tonight is stupid. Think smart, be smart. The Montana Center for Work Physiology and Exercise Metabolism (Montana WPEM) is conducting an exciting research project at the 2008 Badwater Ultramarathon. You have been there done that as far as ultras go. However, here is a chance to put some physiological bragging rights behind your 2008 race. Just how much water does the human body turn over in 135 miles? How does your hydration strategy stack up and protect you from overheating? Have you ever seen a mobile physiological lab in the form of a Airstream trailer? If you want to know – we want you in our project. We have done Western States, now we want to see how Badwater stacks up as we encroach towards the human ceiling for energy expenditure and hydration demands. We are limited to studying 12 racers. Also, we are only able to use racers from the western part of the U.S. for reasons mentioned in the attached brochure. If you are interested, please contact Brent Ruby at the email below and reference the attached Pdf document. 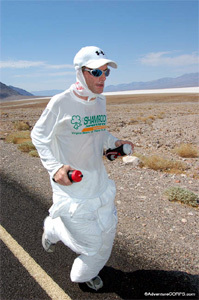 This proposed research would evaluate the effects of environmental stress on measures of hydration, total body water turnover, core temperature, and heat shock protein response during the 2008 Badwater Ultramarathon. Water turnover offers a dynamic measure of hydration demands by quantifying the magnitude of total body water loss coupled with partial or complete replacement over a given period of time. The unique measure of water turnover is not simply a measure of how much water is consumed and how much water is lost, it is an all inclusive measure of water flux through the human system. A 75 kg reference man contains about 45 L of water (~60% of total body weight). During some of our previous field investigations with wildland fire fighters, Air Force Combat controllers, and Ironman athletes our laboratory has demonstrated 12-24hr water turnover values in the range of 6-18 L (up to 40% of total water volume). Even with this data we have no indication that these activities have stressed the human hydration system to its full capacity. Further research, as proposed here, is needed to determine the human ceiling for water turnover in order to further characterize the hydration needs for extended work in hostile environments. Because these types of events may capture the human ceiling for extended muscle work in the heat, these data will provide valuable insight towards the cellular protection associated with a change in heat shock protein response patterns. Moreover, this approach will assist in determining human factors that limit or sustain performance during an extended period of activity. The data collection we are planning for Badwater 2008 will extend our past research because of the unique environment and duration of the event. 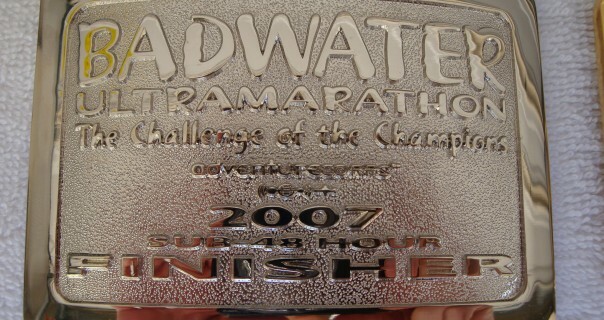 At the 2007 Badwater Ultramarathon we conducted a follow-up investigation to the research we completed at the 2006 race. In 2006, we studied 4 runners and found that their body weights remained stable (<2% change) and their serum sodium concentrations remained within the normal range. However, we observed marked decreases in sweat sodium concentration and increases in urine sodium levels as the race progressed. Therefore, the principle aim of the study at the 2007 race was to gain a better understanding of how hormones that control fluid balance and sodium fluctuate during the race. We recruited 12 race participants (8 men, 4 women) to take part in a study investigating the hormonal control of hydration and sodium balance. We asked the runners and their crews to record all food, beverage, and supplement intake to the best of their ability throughout the race so that we could assess fluid and sodium intake. We measured body weight, serum sodium, sweat sodium, urine sodium, urine volume, and urine specific gravity. We also measured the following hormones in the blood, which are known to influence hydration and sodium balance in the body: Arginine Vasopressin (AVP), Aldosterone, and Atrial Natriuretic Peptide (ANP). Data were collected at 3 times: 1) before the start, 2) Stovepipe Wells (SPW), and 3) the finish line. Fluid and sodium intake varied greatly between participants. Body weights tended to decrease between the start and SPW, but then trended slightly upward from that point to the finish. The changes in weight were all 5% or less. Serum sodium concentrations were normal for all participants at the start line, but tended to decrease between the start and SPW. At that point, 2 runners (both women) were slightly hyponatremic (Na,130-134). There was no trend in serum sodium concentrations from SPW to the finish, but 3 runners were slightly hyponatremic at the finish line (all 3 were women). None of the participants needed medical treatment. Sweat sodium concentration decreased in each participant as the race progressed. No consistent trend was observed in urine sodium concentrations as the race progressed. Arginine Vasopressin (AVP) appeared to increase as body weight decreased and vice-versa (as expected). Neither Aldosterone nor ANP levels were consistently what would be expected considering the hydration status of the runners at the time they were measured. We are continuing to investigate this finding. The studies over the past 2 years demonstrate that runners maintain near normal hydration and serum sodium levels across a great range of sodium and fluid intakes. Although it is still not clear how the hydration hormones are acting during the extreme challenge of running the Badwater Ultramarathon, we have some interesting data that we will continue to analyze and gain a better understanding of how the body responds to survive during this remarkable challenge. The next step is to combine what we’ve learned from the Badwater Ultramarathon studies in 2006 and 2007 and publish our findings. Hello fellow Ultras. Welcome to Badwater 2007. These calculations are the choreography of the annual Badwater 135 Mile ULTRA Marathon. It’s all there, from the mythical sub-24-hour finisher to the 60-hour official finishers. From start to finish, it’s a “Grand Parade” of the best and toughest distance runners in the world – from around the vast stretches of our Planet Earth, they merge for the Death Valley Challenge. It’s hype and glory of human endurance against this unpredictable sanctuary of Mother Nature. Will She be kind and forgiving or will She unleash Her power of vengeance upon those mortals who dare enter this domain of pain, agony, and sometimes more? Let it be understood, by all, veteran or novice: tread lightly and ALWAYS with respect. Each athlete and crew member must never forget that, as a guest of Death Valley National Park, you must obey the Park’s and the Race Organizers’ rules and regulations at ALL times. The purpose and goal of every team member is the ultimate conclusion of a safe and gratifying performance. Any participant’s failure to honor these guidelines may result in the disqualification from all future Badwater Ultras. Honor and respect is a unique consideration in these types of events, in that there are many miles and hours of which to gain a life-long appreciation of the course and its participants. Fair and courteous involvement is the rule. This is the “Main Event” – don’t spoil it by doing any of those things that erode the value and beauty of this once-in-a-lifetime experience. Be encouraged by, and absorb, the energy of thousands of footsteps past. Let your quest, be it seemingly slow, remain steady as you trod patiently, while enduring the tremendous and unrelenting heat, through the bowels of Hell. I urge all of you, especially the crew members, to recognize what is natural and within your “limits”. Many miles and hours stretch out before you… before ALL of you. There is NO reason why any athlete or crew member should fail, IF you abide by reason and common sense! Don’t be “cute” as this event is serious business: your life will depend on it. If, as you train for this 135 mile “trek,” you can: (1) walk 50 miles each day, for three days while being mindful of proper foot-care, (2) tolerate high temperatures by exercising respect, caution, and proven techniques, then you have no excuse for failing to finish this torturous trek safely and as an Official Badwater Ultramarathon Finisher :)) Good Luck! Finally, enjoy your every step by “gliding” the 135 miles as an adventure rather than as combat. You will never beat this race course; you can only traverse it smoothly or “uncomfortably.” The choice is yours. Look at my calculations above and select a reasonable and safe “time-range” BEFORE the race. Stay comfortable and enjoy your adventure. Your elapsed time will be better than you predicted and so will your experience. HEAT is the main nemesis, acclimate your body NOW!! Start using a sauna ……. on your EXPOSED body. Do not wear any protective clothing. ENDURANCE is very slow to develop. 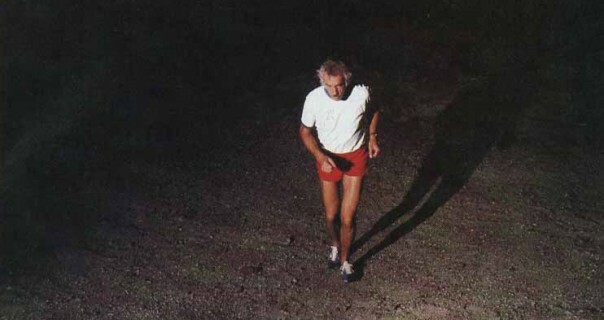 Set a target of being able to WALK, ONLY, at 20 to 30 minute per mile (LSD) pace, NON STOP (NO SLEEP) for 24-30 hours. Do not exceed this pace, nor train (LSD) more often than once a week. Leg speed must also be developed. Adapt an easy target of being able to run a 10K in 43-45 minutes. Try this on the following day of the endurance workout. This is a training goal only, NOT COMPETITION! Initiate a strict program of increasing your range of motion (flexibility). Long, loose, and supple body mechanics reduce fatigue. Increase your oxygen up-take. The best way to measure this is by your recovery rate. I find the quickest, and most successful, is fast interval work-out on a Stationary Bike. Longer anaerobic periods with shorter recovery time is the best indicator of having a strong heart and lungs. My success at Badwater was entirely due to the fact that I was surrounded by high quality, dedicated people who genuinely wanted to help me be successful. 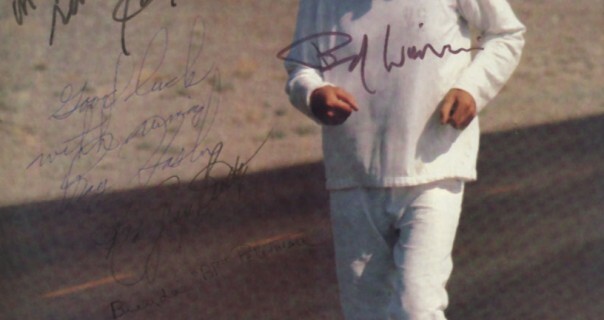 Badwater was not an individual achievement but rather a team effort. A group of four Badwater virgins somehow entered Death Valley and managed to traverse 135 miles through the steaming, hot desert and come home with the coveted sub 48 hour buckle. There were challenges along the way that I’ve never encountered in any ultra running event I’ve participated in but they were overcome because of the strength of the team. While no one other than me had a particular role at the start each acquired their own identity as the race progressed. The lone female member of our team was the leader and took control when I needed her most. I leaned on her hard and she never once let me down. My friend from Wisconsin was the silent strength of the team. He could relate to the suffering I was experiencing as he too has suffered and persevered through grueling events.While he communicated in a different way than my other two crew members I was able to understand and benefit. My third crew member and my best friend and confidant experienced my worst moments with me. He could very well have left me in the desert whining to myself but what he did instead was listen. I was walking death between miles 115-122 as we looked for Lone Pine. I relied on my best friend to be my life support system and somehow he kept me moving forward. 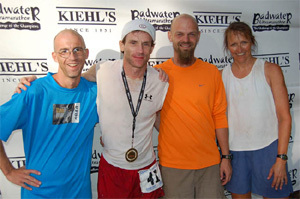 Badwater was a success not only because of the finish but also because of what I learned about others. I had two total strangers enter my life on those 3 days and they stood by my side until the bitter end. My one good friend who went into the valley of Hell with me showed me that indeed he is the best friend I’ve ever had. I learned that I have two very good friends that live far away but despite the distance we will always be friends and I can always count on them to be a positive influence in my life. I learned that it is okay to lean on others once in awhile and that true friends will indeed come through for me under any and all circumstances. 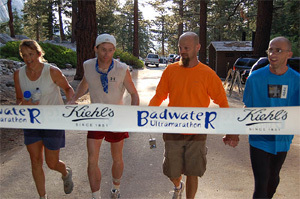 Badwater is indeed a team event and without a strong group of people surrounding the runner success would be impossible. Are You Giving Your Skin Enough Love? Download this article as PDF – Reprint in your running club newsletter! Gracia Walker of Kiehl’s poses with just some of the fine skin care products given to all Badwater entrants and staff in 2005. An interesting thought struck me while lecturing to a group of hard-core triathletes recently. Yes, they are fit, yes they are intense, and yes, they are amazingly motivated people, I thought. But gosh, the ones who have been doing this for a while look a bit weather-beaten. I kept this thought in mind when I was at a local road race in New York. Again, many of the runners who had been out doing their thing for a number of years looked a bit leathery. What are the factors that lead to sun-damaged skin and skin cancers? With a thinning ozone layer, increased time in the sun leads to increased skin damage. Who is at greatest risk? Genetics play a role and skin pigmentation and a family history of skin cancer are both important. But even more important is a history of deep sunburn. Repeated, deep, painful sun damage has been strongly linked to pre-cancerous skin lesions. Ok—so that sounds good, but let’s get real, triathlons and other endurance events are run during the middle of the day. Personally, I can recall the sun beating down on my back in Kona during the Ironman Triathlon, thinking to myself, “I’m sorry skin, I’m sorry.” Much to my dismay, by the way, there is a residual burn on my back from that day, despite my efforts at sunblock use. Are triathletes and other endurance athletes taking skin protection seriously enough? The hydration message seems to have gotten through, as has the threat of hyponatremia and the benefits of stretching and weight training. But is the sunburn prevention message resonating? Unfortunately, I’d say, not yet. Yes, there are some aid stations along the course of some races that have sunblock, but often, these are few and far between. Until we arrive at the day when skin care and sunburn prevention are taken as seriously as they should be, the onus, my friends, is on you. If you are involved in outdoor endurance sports, you must protect your skin. This means consistent use of waterproof sun block. SPF (sun protection factor) means the relative time it will take for you to burn your skin. For example, if you might burn in 10 minutes normally, then an SPF of 15 enables you stay in the sun for 150 minutes without burning. Of course, these numbers have different ramifications for everyone, so being vigilant is key. For me, I try to find a product that stays on when wet and is at least a SPF 30. Throughout race day, take the extra time to apply a bit more sunblock, even if it “costs you” a few minutes. Likewise, when you are training, load up on skin protection. Slop it on, all over yourself, and make sure to bring some for later. Also, make sure to use adequate head protection to prevent burns to your face, ears, and the top of your head. And what about getting a tan? As many members (especially female ones) of my triathlon team tell me during our long bike rides, “It’s OK to fake it; we all do!” Meaning, if you want to be darker and it’s important to you, use fake tan. Even if it doesn’t offer sun protection, it’s much safer than a real suntan. And lastly, if there are any new or funny looking moles or patches on your skin, speak to your doctor or dermatologist. (They can be very small, by the way.) All types of skin cancer are treated more easily when they are caught early. As we spend hours making ourselves faster, fitter, and healthier, let’s be sure to remember that our skin needs love. Protect it—unless you are a lizard or a snake, you only get one coat! Jordan D. Metzl, MD, is a nationally recognized sports medicine specialist at Hospital for Special Surgery in New York City. In addition to his medical practice, Dr. Metzl is a 25-time marathon runner and four-time Ironman finisher. At the Badwater Ultramarathon in 2006, we conducted a descriptive study investigating sodium balance. We recruited four race participants, 2 men and 2 women, and measured body weight, serum sodium concentration, urine sodium concentration, sweat sodium concentration, and urine specific gravity at 4 collection points: 1) before the race, 2) at Furnace Creek, 3) at Stove Pipe Wells, and 4) at the finish line. The subjects crews collected and recorded additional information to the best of their ability, including sodium intake from food, supplements, and electrolyte drinks, as well as amount of urine output. Sweat patches were applied at each collection point and removed 20 minutes later and stored for later analysis at a hospital lab. Serum sodium was analyzed immediately with iSTAT point of care analyzers (Abbott Labs). Urine was collected in urinals and analyzed by the researchers at each collection point for specific gravity (which assesses hydration status) and urine sodium concentration. Weight was taken with calibrated scales. Sweat sodium concentration decreased in each subject as the race progressed. Urine sodium concentration increased in each subject as the race progressed. Serum sodium concentration remained normal in all subjects throughout the race. Weight changes during the race fluctuated between 0 and 2% for each subject. Sodium intake between subjects varied tremendously. Sodium balance homeostasis was maintained despite extraordinarily challenging conditions and bodily stress. We will be submitting these data for publication. We will be conducting additional studies to investigate the physiological mechanisms responsible for these trends.